In this project, I focus on understanding the methods and means by which information and communication technologies are embedded in Native landscapes, and to what ends. Broadly, this project has allowed me to discern the discursive communities through which ICTs are imagined, designed, and deployed in Indian Country. I've also been able to share findings from prior research with people directly involved with building information systems for tribes, tribal governments, and Native communities, as well as with Indigenous thinkers contending with conceptual notions of sociotechnical systems and social change. Reference: Duarte, M.E. "Connecting Beyond the Interface: Indigenous Knowledge, Mobilization, and Deloria's Right to Know," Paper presented for the Graduate School of Education and Information Studies, University of California, Los Angeles, April 7, 2016, Los Angeles, California. 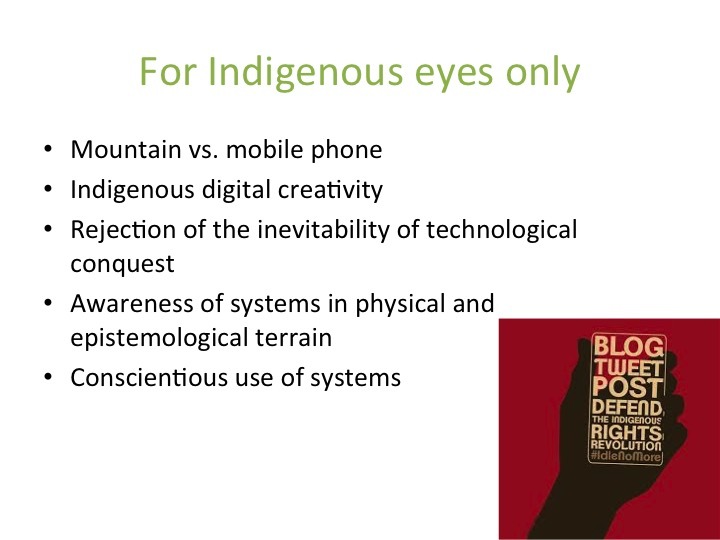 Reference: Duarte, M.E., "Decolonial Chats and Memes: Inscribing Indigeneity in the Digital Overlay," Native American and Indigenous Studies Association, June 2015, Washington, D.C.
Reference: Duarte, M.E., "'Like' No Drones on Indian Land: Digital Connectivity and Political Resistance in Indigenous Landscapes," Association of American Geographers, April 21, 2015, Chicago, Illinois. Reference: Duarte, M.E., Belarde-Lewis, M., (2015) "Imagining: Creating Spaces for Indigenous Ontologies," Cataloging and Classification Quarterly, 53, 5-6. Knowledge, Technology, and the Pragmatic Dimensions of Self-Determination. Reference: Duarte, M.E., "Knowledge, Technology, and the Pragmatic Dimensions of Self-Determination," in Woons, M., ed. Restoring Indigenous Self-Determination. Bristol, UK: E-IR Publications. Reference: Duarte, M.E. "The Phones They Carry: Idle No More, Social Media, and Native Women's Political Organizing," INTERSECT: Global Indigeneities: The State of Play, American Indian Studies at the University of Illinois, Urbana-Champaign, September 2013. Advisory Board: Tribal Telecom and Technology Summit. Co-chairs: Randy Evans, Brian Tagaban. Reference: Duarte, M.E. "Weaving Pathways Across the Digital Divide," Montana Tribal Broadband Summit, Helena, Montana, October 2014. This research was supported in part by a Chancellor's Postdoctoral Fellowship in American Indian Studies at the University of Illinois, Urbana-Champaign.